Australia’s East Coast Dress Up is coming…. Want to have some fun while helping children in hospital? 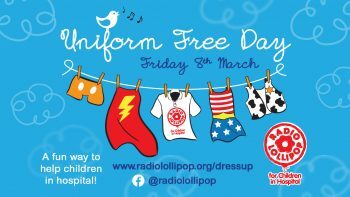 Support our Uniform Free Day celebrations on Friday March 8 across the East Coast of Australia as we raise funds to help our wonderful team of volunteers provide care, comfort, play and entertainment to children in hospital. Wear a costume or something crazy or colourful to work, school or sport for the cost of a gold coin donation. Dress for Fun, Raise some Funds! Share the link www.radiolollipop.org/dressup and our Facebook page www.facebook.com/radiolollipop. Use the form below to make a donation today.